You are currently browsing the tag archive for the ‘Mexican Sunflowers’ tag. There’s something to be said for laziness…or lassitude…or a laissez-faire approach to life. 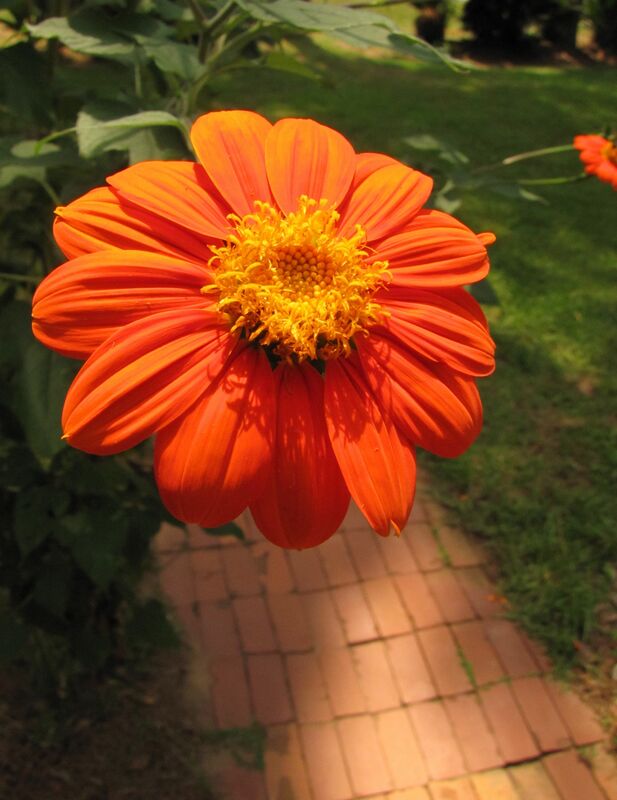 It may be a combination of all three, although I’m rarely accused of taking an easy approach to life, that had me watch the rogue Mexican sunflower sprout next to my brick walk. I knew full well when those fuzzy little leaves crawled skyward that this one stalk would crowd my access to the front porch, and that guests would have to duck or sway in order to avoid bumping into a blossom. But, laziness, being overwhelmed with life this summer, and a certain what-the-heck-let’s-see-what-happens flippancy gave me rein not to pluck the plant from this spot. Instead, I watched and even watered the brazen stems, branches, and buds as they grew. What joy! Yesterday I nearly collided with a butterfly, the day before, a bee, both drawn in abundance to these glossy orange girls. Distracted and harried this summer, I’ve been gifted by having all this brassy beauty, literally, in my face.